Do you remember “The Barndoorminium” by Fixer Upper and Magnolia Homes? It was one of the most innovative approaches to turn an old barn into a spacious modern home with room for a large family’s festive gathering. 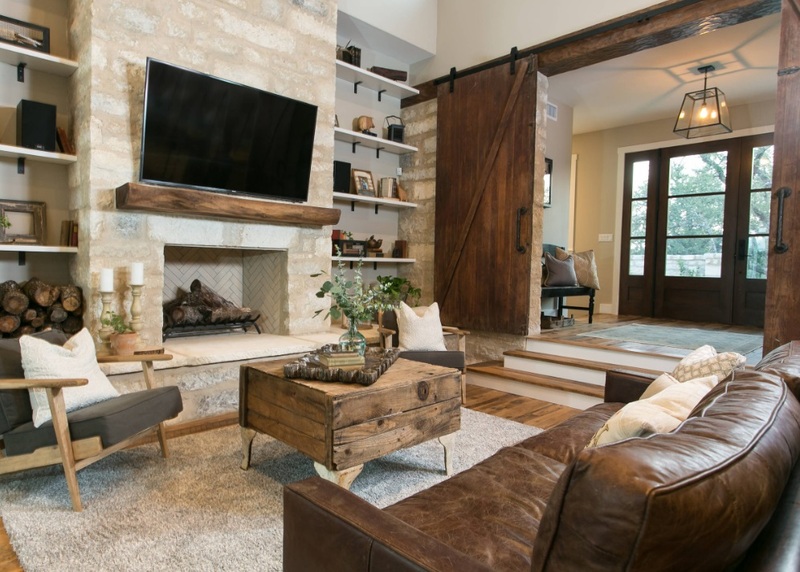 If you are a rustic decor aficionado, then you are familiar with interior design trend of bringing barn doors inside as a bold statement of functionality and style. 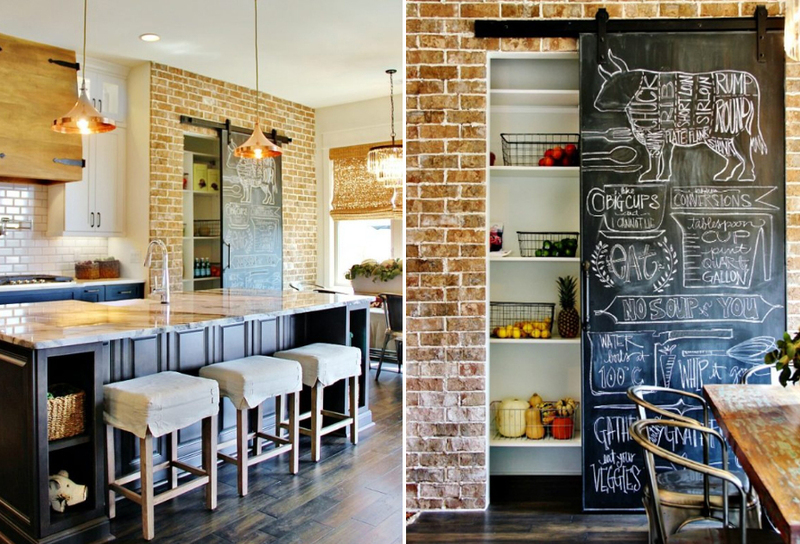 There are so many inventive ways to incorporate barn doors in your home: close off dining room, separate a pantry with reclaimed wood antique finds, add privacy to a craft-closet, or give little artists a fun surface to decorate with chalk-board sliding doors in kids’ room. The colors, possibilities, and design ideas are numerous and inspiring. Check them out – it will boost your motivation to redecorate your space or add a few rustic elements to mix old with new in your existing interior. The open floor plan is still on homeowners wish list, so interior doors are evolving, bringing flexibility while allowing to join spaces for fun family gatherings or close them off for privacy. 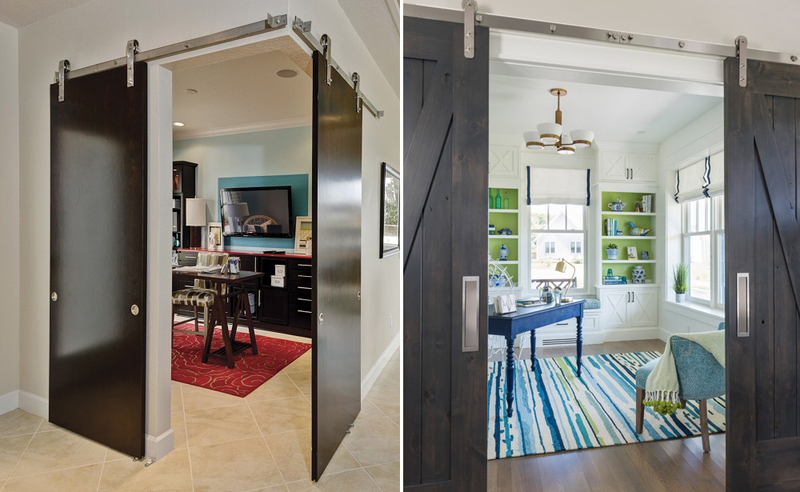 Unlike traditional hinge-mounted doors, barn doors act more like room dividers and rustic accents, allowing families to choose the degree of openness for the home. Some unexpected unique finds at the local antique shop may bring a real piece of wall art to your home if you let your imagination do the work. You may even incorporate modern-looking x-ray printables into one of these rustic rooms. 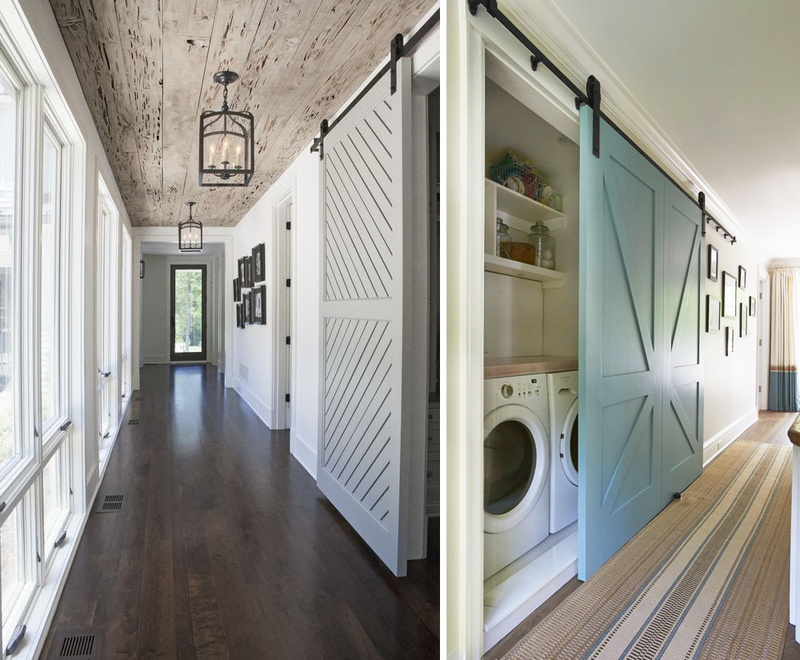 If you worry that certain design trends that are so hot today will quickly go out of style tomorrow, you would be surprised that barn-doors-go-inside idea has been here for over a decade. It has evolved over the years to include more choices for hardware and finishes, numerous DIY tutorials you can do on a budget, and innovative modern options that are bold in their ingenuity. All this makes installing sliding interior barn doors a perfect winter project for a crafty person suffering from a cabin fever. As an added bonus, this project creates a perfect backdrop for warm and cozy family photos. 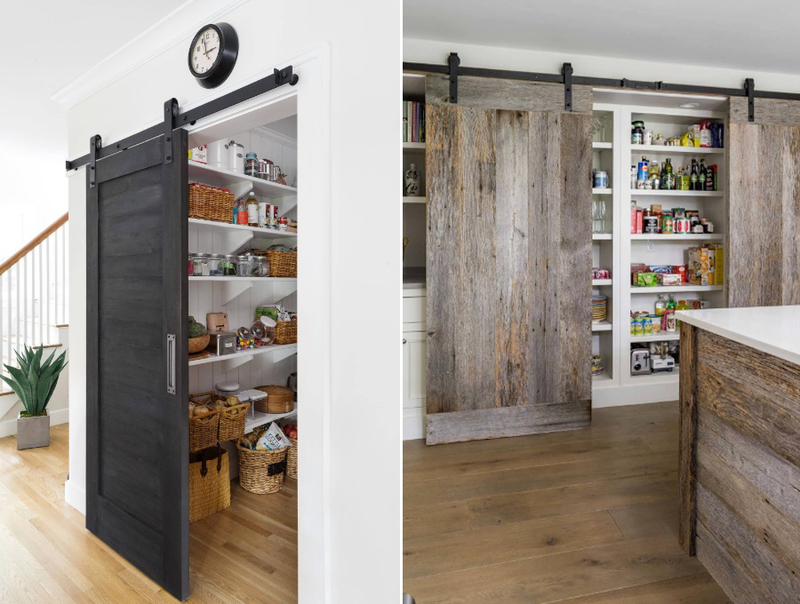 You would feel so inspired to redecorate your kitchen when you see this creative barn door design idea used to accentuate a hidden pantry in this light yet rustic kitchen. You can put your own messages, teach kids math, post a weekly family menu, or even use some humor to lighten up the mood. It is a common dilemma for interior decorators and homeowners: how to break the monotony of a long hallway? Check these 2 masterful solutions to a common problem: light-colored interior sliding barn doors are both practical and stylish. Rustic black hardware compliments the light fixtures and dark frames of a gallery picture wall, reminiscent of modern farmhouse decor. Reclaimed wood paneling on the ceiling is a great example of mixing old with new. 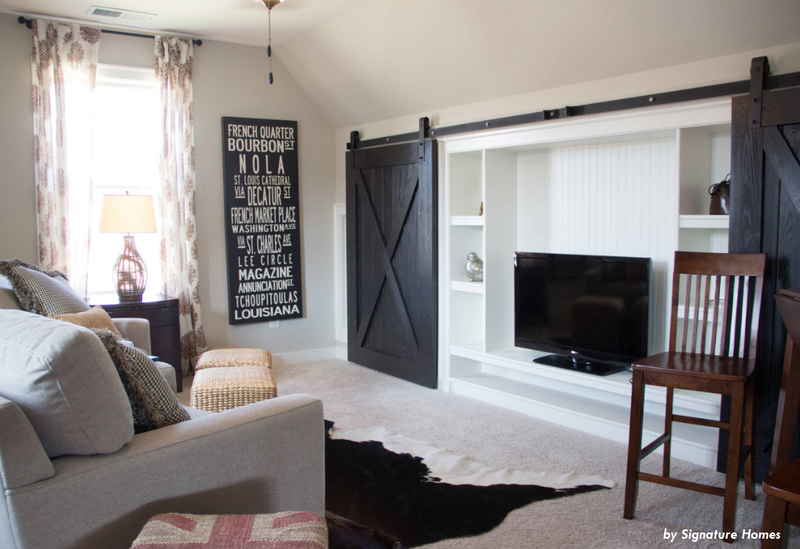 Modern flat screen TV may throw a wrench into a cohesive farmhouse-style design, so it becomes popular to close entertainment center with sliding barn doors, like in this family room. With a variety of finishes available, black sliding doors make a logical choice in this interior playing well with the dark wall art, leather furniture, and rustic black & white cowhide rug. How do you turn an old barn into a modern house? 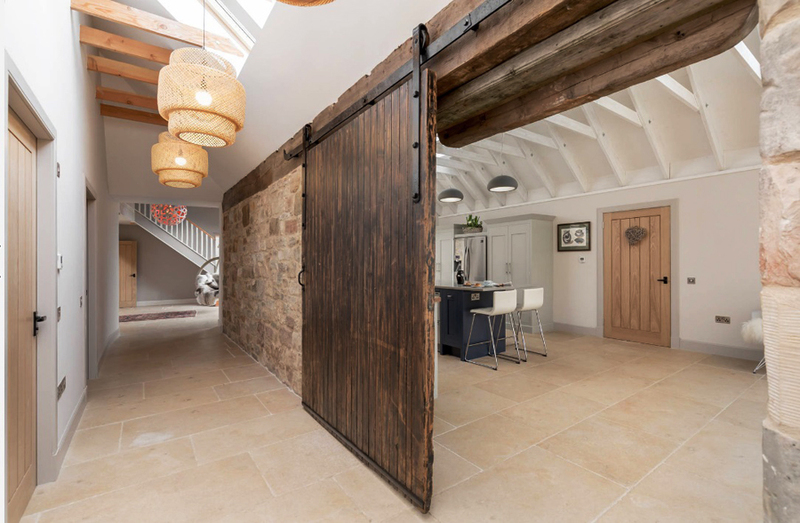 This a masterful example of conversion where a reclaimed stone wall and reclaimed wood barn door became both practical and decorative. Open and airy modern kitchen can be closed or open, depending on the use of the space. Are you ready to try building your own barn door? 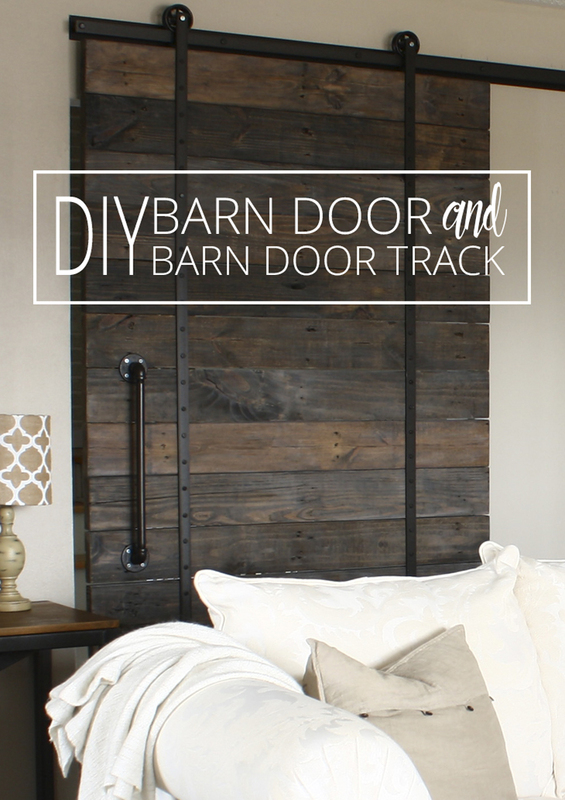 This handy barn door tutorial will walk you through all the steps. Great budget-friendly DIY home project to try and it will not break the bank. If your corner office is part of your home, as cyber-commuting is becoming more popular, you would appreciate the flexibility of opening or closing it. Ideal for a mom working from home or a versatile yet professional home office. 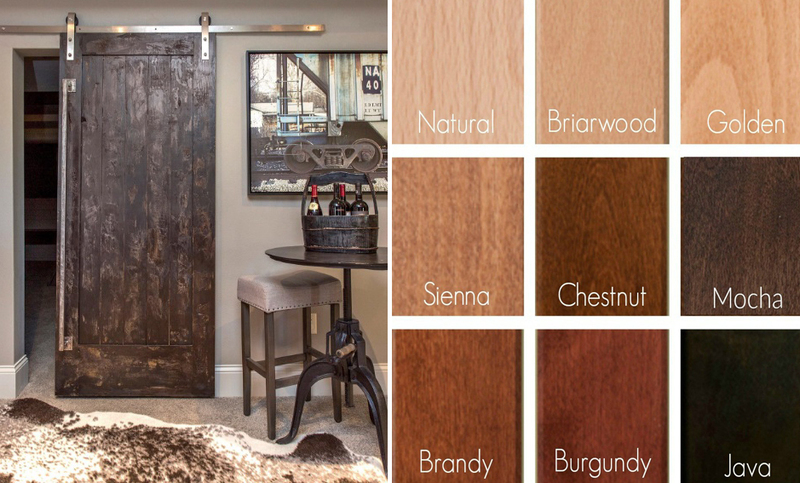 If you a dreaming about adding a barn door to your interior but don’t have time to build your own, you can order a natural barn door package and pick up a finish that will match your decor. Barn doors are manufactured in Midwest (USA) by Grafted Hardware and company website offers free shipping. Perfect selection of rustic elements makes this space rustic, inviting but cozy. DIY coffee table from reclaimed wood and a simple rustic mantel above the open fireplace are complimenting walls’stonework and a tall barn door. Just a few rustic materials add so much interest to this classic great room with cathedral ceilings. Black metal hardware, rustic chandelier, and wooden beams break the monotony and accentuate a classic white space. 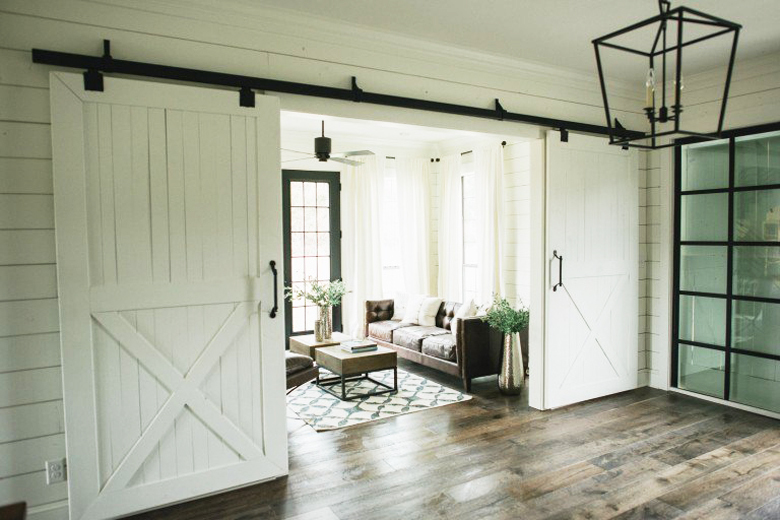 White barn doors with dark hardware look very classy in this interior space. Black single sliding barn door fits perfectly in modern and functional Dutch Colonial house. A mix of classic finishes and reclaimed wood in the second example creates warm and organic kitchen space. 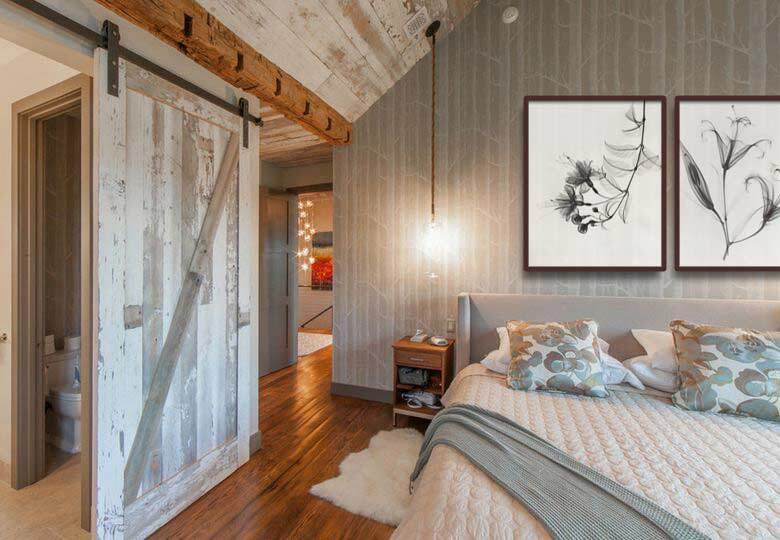 Note that hidden barn doors’ handles (or lack of them) are more practical solutions for a tight space. Source 2: Jewett Farms + Co.
An incredible use of reclaimed timbers in this custom mountain home in Vermont! 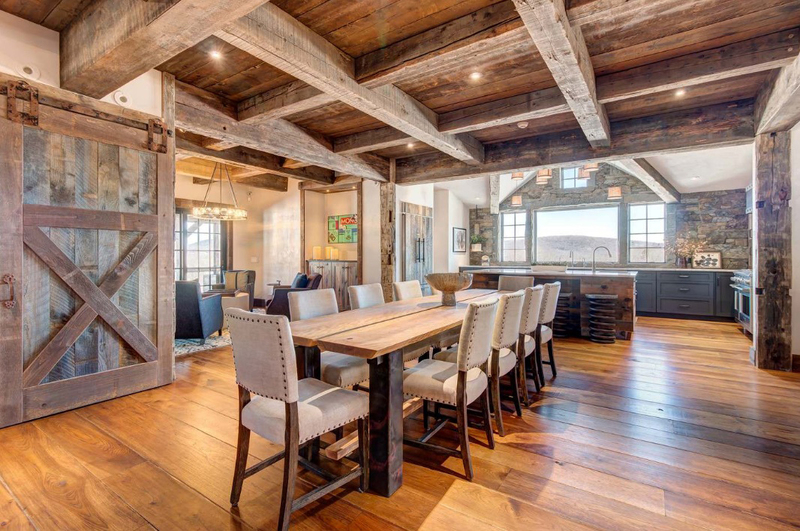 Everything is rustic in this space: giant sliding doors, big dining table for festive family gatherings, reclaimed stonework, and impressive wooden beams accentuating the ceiling. 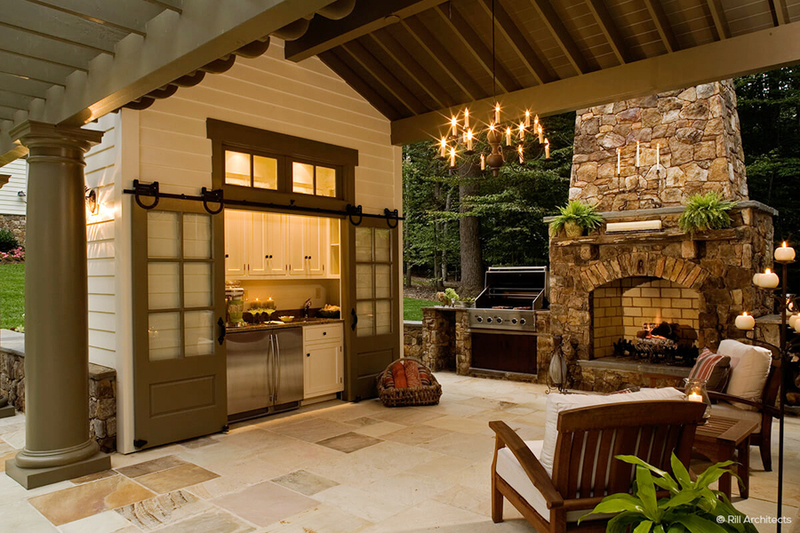 As the trend of taking living room and kitchen outdoors continues, any chef would appreciate this fabulous multi-functional patio and a well-equipped kitchen with sliding exterior barn-doors. It is just perfect for a barbeque with friends, a cozy evening sipping hot chocolate by the fireplace, or a fun New Year cocktail party.